Random Panel: What girl WOULDN’T love a toilet? 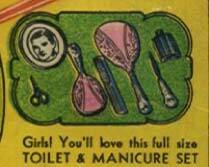 10 Responses to Random Panel: What girl WOULDN’T love a toilet? Finally a comic advertisment that works!!! a. A fixture for defecation and urination, consisting of a bowl fitted with a hinged seat and connected to a waste pipe and a flushing apparatus; a privy. b. A room or booth containing such a fixture. 2. The act or process of dressing or grooming oneself. 4. The cleansing of a body area as part of a surgical or medical procedure. Good girls don’t use the toilet! @MartainBlue I Remember In The Diary Of Anne Frank, She Gave Her Mom Toilet Water, Which Was Perfume lol. But it’s still funny as it looks to modern eyes in that ad. @Danny Beaty: And a good man never lets her chain reach that long.